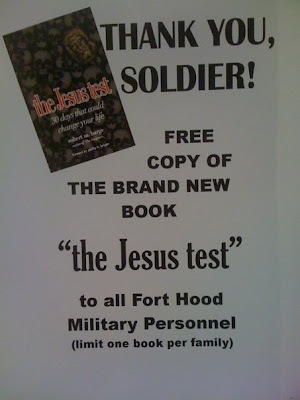 On Friday, Denbigh and I had the honor of accompanying Robert Barge, author of the Jesus test to Killeen to give away copies of his book to soldiers. Armed with 500 books, we started handing them out. There are those who did not want a copy and I am sure a few who saw Jesus and thought we might be Jehova's Witnesses or something else cultish. With every book that was taken from one of our hands, I teared up. I don't know about you, but the tragedy at Fort Hood really got to me. I thought about my own dad serving in the military. It could have been any number of people we love. I desperately wanted to do something, anything to show God's love. One beautiful story that we heard was from a man who told us that his son had been estranged from him and had told him he never wanted to talk to him again. That young man was scheduled to be in that room that day and something happened so that he wasn't. That night, he called his dad. Blessings to you, Robert Barge. Thank you for letting us tag along.